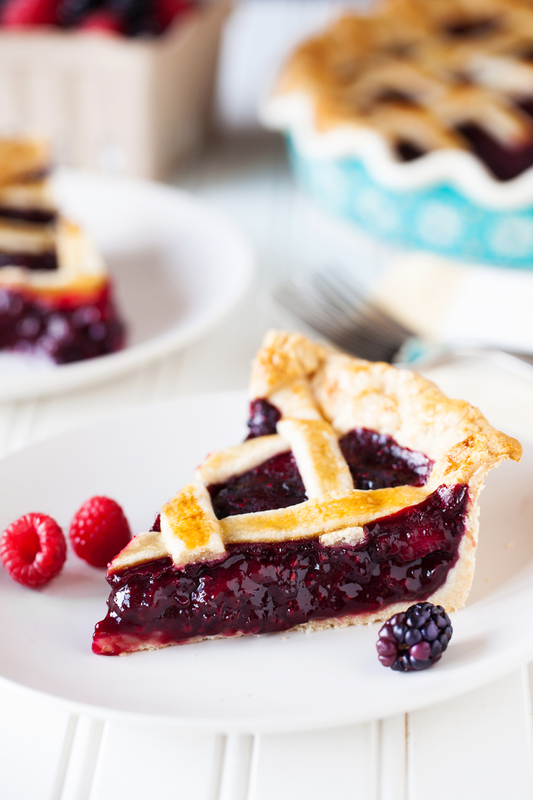 This Triple Berry Pie is bursting with flavor and topped with a delicious golden crust. I have a confession…I love anything with berries in it–I may even have a slight obsession with it. 🙂 This triple berry pie is delicious and super easy! I love making a homemade crust but you can also go simple and use store bought crust, they taste delicious too. 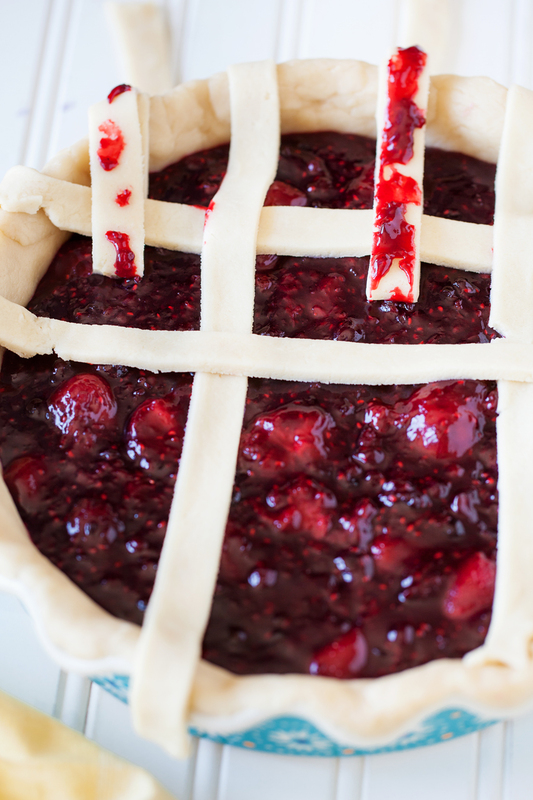 I’m even going to show you how to get that pretty lattice crust look. I promise, it’s way easier than it looks and is such a fun way to add a bit of fancy to a pie for Thanksgiving, Fourth of July, or other special occasions. 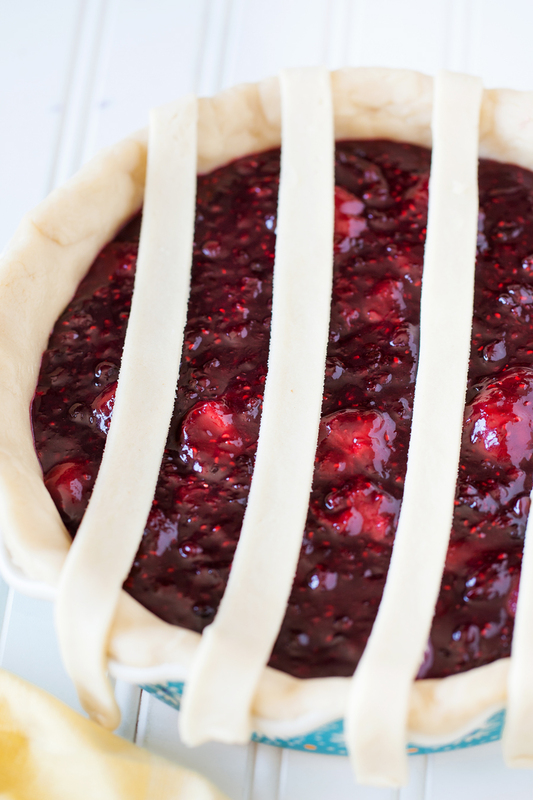 Delicious berry filling wrapped in a buttery crust! 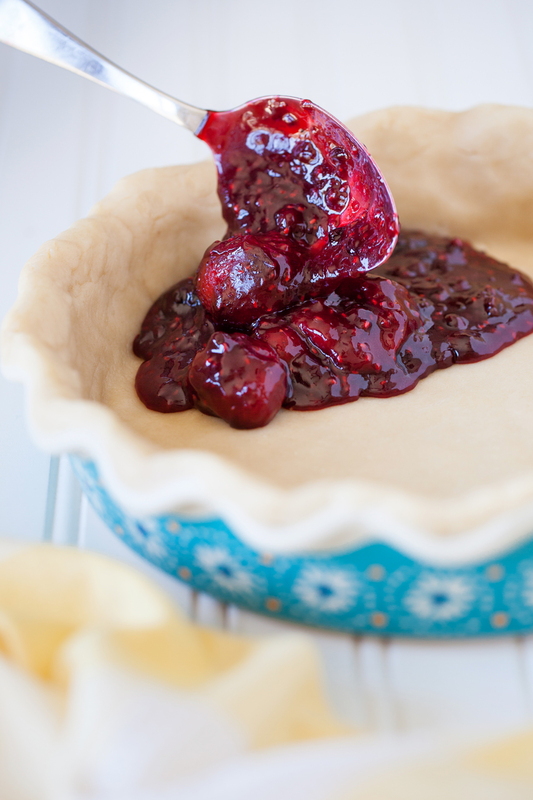 Perfect for Thanksgiving, Fourth of July and just when you need some pie! Add berries, sugar and lemon juice to a large saucepan over medium heat. Simmer, until warm and juicy, about 5-10 minutes, stirring occasionally. Mix cornstarch with a small amount of water until cornstarch has dissolved. Gently stir cornstarch mixture into berries and allow to simmer until thickened, about 2-5 minutes. You want the berry mixture to be thick and not too runny. Remove from heat and stir in the butter. Pour berry mixture into unbaked pie shell. Add lattice top. Brush a thin layer of beaten egg white over the top of the pie and sprinkle lightly with sugar. Bake at 400 degrees F for 40-45 minutes. Check it after about 25 minutes and place a piece of tinfoil over the pie to prevent the crust from burning. Remove to a wire cooling rack and allow to cool. Once cooled completely, you can cut into it or cover it and refrigerate it overnight to serve the next day. For filling mix together 3-4 cups of mixed berries. You can use frozen berries but be sure to keep them frozen as long as possible. Mix the berries with 1/2 - 3/4 cups sugar and 4 tbsp. cornstarch. Allow to set for a 10 minutes (even frozen berries). Pour into pie crust. Top with crust and bake for 40-45 minutes. After 20 minutes place a piece of tin foil on top to prevent burning. 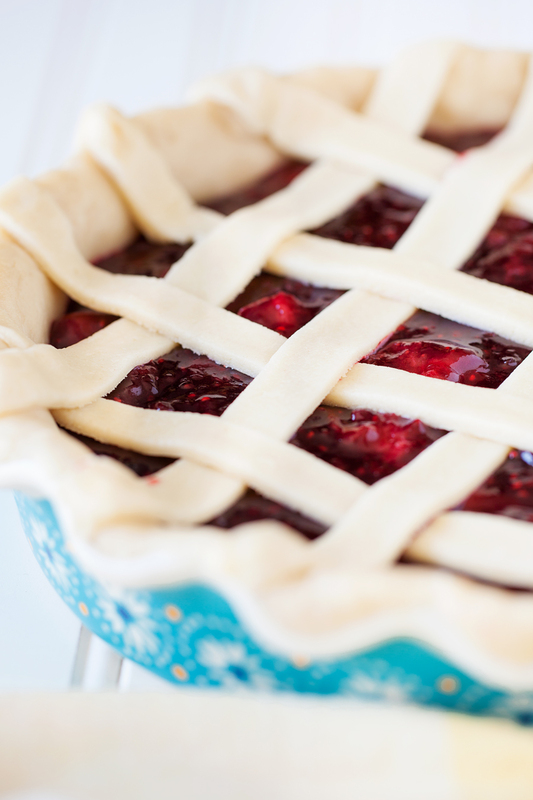 Lattice crust just makes everything look prettier and shows off the delicious insides of the pie–so let’s get started! Take your top crust and roll out into a long rectangle. Cut into 1/2 -1 inch strips. The width depends on the thickness you like. I cut out about 9 strips. You can make more or less strips depending on the look you want. My crust is a bit thicker because we like thick crust but feel free to make yours thin. Once you cut your strips place 4 or 5 strips on your pie about 1/2 in. to 3/4 in. apart. Lightly fold up every other strip and lay a strip of dough underneath. Place your folded strips back down. Now, fold up the opposite strips that you did last time. Lay a piece of dough underneath the folded strips and lay back down. Keep going back and forth until your pie is finished. Trim your overhanging edges and seal with a fork or fingers. ENJOY! This post was updated with new pictures a slightly different way of making the pie which as resulted in less “runny” pies. 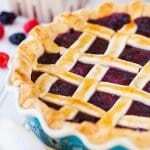 Kutos to you Katie for sharing this great recipe for berry pie. I greatly appreciate your effort in sharing your recipe ideas. I often search the internet for reference when cooking pies. Not for an exact recipe, but just to make sure I don’t miss anything and to get the ratios right. I’m sure all your pies turn out perfect, but for some of the reviewers with runny pies, I prefer to use sure-jell. 4-5 Tbls worked great. 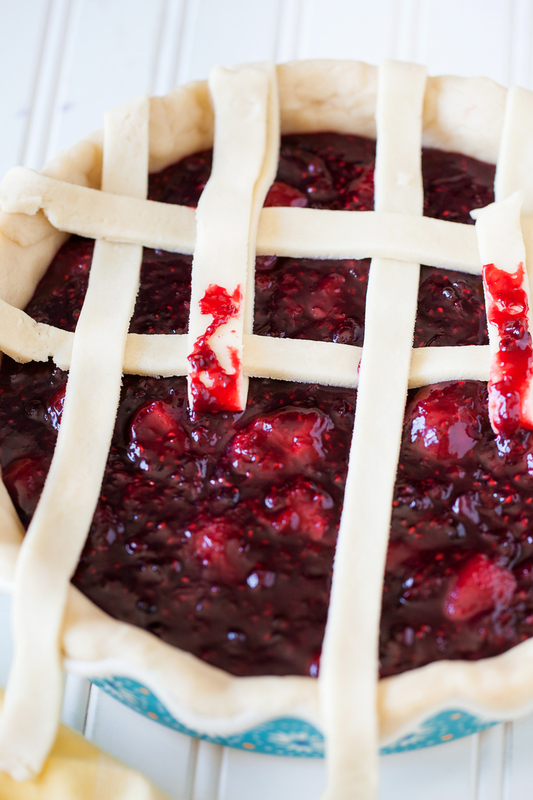 It also helps to let the filling cool before attempting the lattice type crust. Thanks for posting this recipe! I used it to make my first berry pie! After reading a few other cooks say it turned out liquidy, I tweaked it just a little. After simmering the fruit, I strained it with my colander with a pot underneath. Then I used about a 1/2 cup of that juice to mix the cornstarch into, mixed that into my fruit to make a slurry, and let it completely cool (I added about another 1/2 of the juice to the slurry until it got to the consistency I wanted), before pouring it into my pie crust. It’s cooking right now but I think it’s gonna turn out great! Thank you for sharing this recipe! I see that you updated this recipe. The original one was my go-to berry pie recipe and I’m wondering if you still have that version that I could somehow use. I’m sure this one tastes amazing too, but I don’t love the idea of everything being mushed together. I liked the individual berries in the pie. Hi Colleen! I’m sorry your pie didn’t turn out quite the way you were hoping it to. The crust can be difficult to work with. I found that if you place the dough in the refrigerator for 1/2 and hour to a couple hours to help it get nice and firm helps a bit. Don’t be afraid to add more cornstarch or flour to your fruit if you notice there is alot of juice. The cornstarch or flour will help thicken the sauce. Glad you husband still liked the flavor. 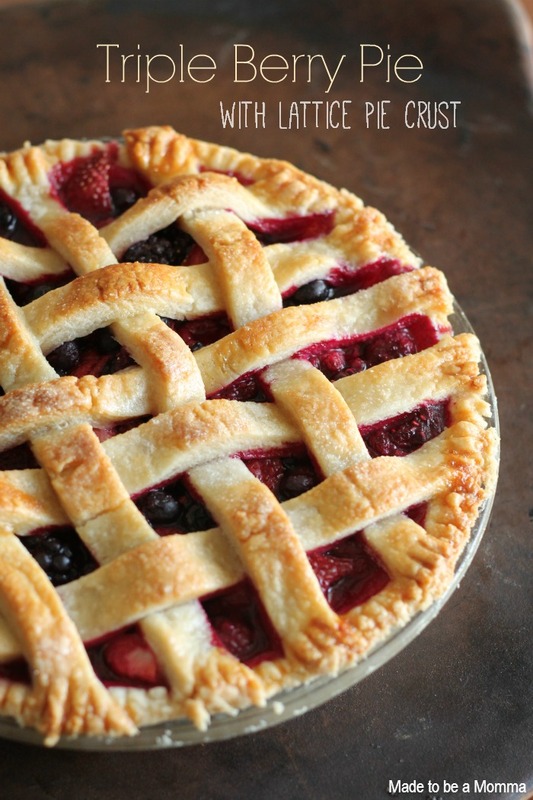 Hi Katie – I’d love to make this pie – what size pie dish is the recipe for? – 8 inch? – 9 inch? Can you use frozen fruit? If you do would you put in pie frozen or unfreeze them first? does this recipe make one pie or how many? I’ve never made a pie before. Weird, I know! 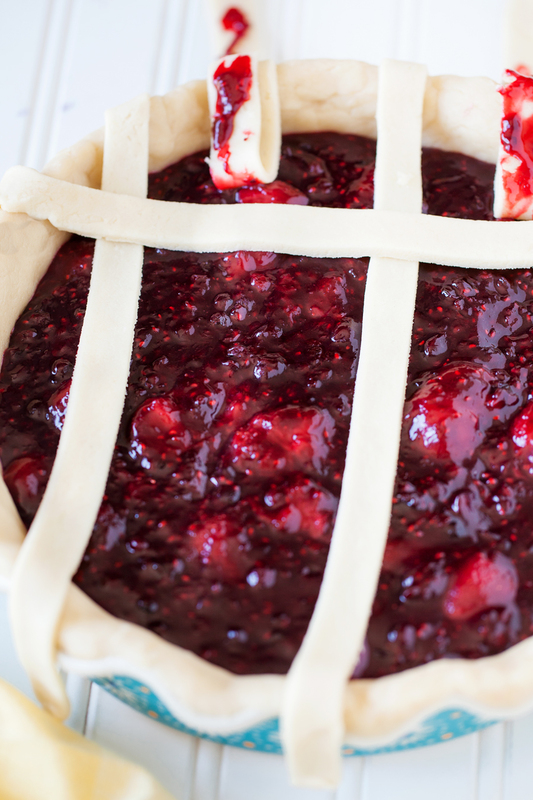 This triple berry pie looks delicious, I might have to try it out. What a beautiful pie! 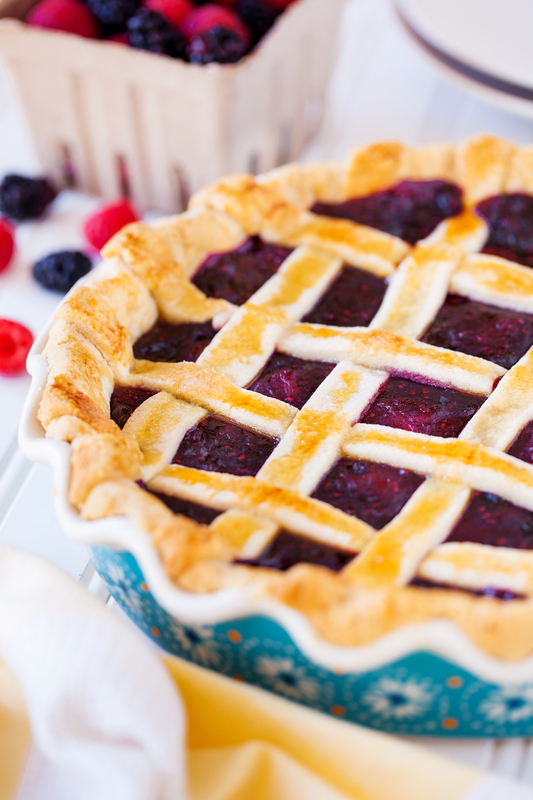 Berry pies are the best. I’ll have to try this recipe this summer. I love berry pies, and this triple berry looks delicious! All that berry flavor in one bite…yummy…thanks for sharing! This looks so perfect and tasty! Make me some!? I bet there’s a little bit of summer in every bite! Looks delish, Katie!